SenSura® is the core range of ostomy appliances from Coloplast. A unique double-layer adhesive makes SenSura pouches secure, as well as keeping skin healthy. 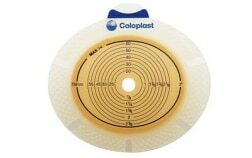 Coloplast developed the SenSura range, working closely with healthcare professionals and people living with a stoma. Listening to their experiences, products were developed to meet the needs for all-round security and greater wearing comfort for people with a stoma. All –in-one appliance for maximum security and discretion. SenSura Click two-pieceMechanical coupling with extra reassurance. Audible click confirms secure locking of pouch to baseplate. SenSura Flex two-piece Adhesive coupling system providing benefits of a one-piece. Unique combination of security and flexibility. SenSura post-operative appliancesA range of appliances for the post-operative phase, supporting a smooth and confident transition to self-managed care.